The warm air in your house rises naturally. As this warm air escapes into the attic and out of the house, matching outside air gets sucked in through leaks in lower levels. This combination of conditioned air leaving your home & unconditioned air infiltrating your home is called the Stack Effect. The Stack Effect is one of the major factors that contribute to your homes energy loss and high utility bills. Air sealing your home is one of the most economical ways to lower your energy use and reduce your heating & cooling bills. The overall goal is to reduce the amount of air that leaks in and out of your home. A home energy assessment or energy audit can easily detect & prioritize your homes' specific areas of concern. Air leakage occurs when outside air enters and conditioned air leaves your home uncontrollably through cracks or openings. A properly air sealed home will experience lower energy use and a more comfortable living area. 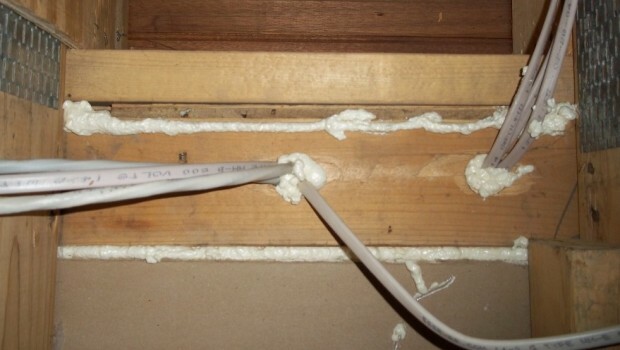 Some areas of air infiltration are easy to discover and fix. While other areas of the home are almost impossible to detect without the proper equipment. Spaces around doors and windows for instance can be easily caulked or weatherized to stop air leakage but rim joists, knee walls, sill plates and chimney shafts will need to be addressed by experienced professionals. Once you detect and prioritize your home's air sealing needs you can begin air sealing your home yourself or hire a BPI certified insulation contractor to do the work for you. To get started just contact us for a free in home assessment. Our highly trained staff of insulation professionals will work with you to make your home more comfortable and more energy efficient.